Imagine you’re having a holiday dinner at home. A tablecloth is spread. Silverware is laid. All is perfect until you knock over a glass of red wine. What happens? Quickly you spread open a white table napkin and drop it over the spill. The puddle of wine seeps through. The tablecloth is now, in a way, a memory. The napkin is a map of the little lake of wine. The wine is infused in both. Even after you throw them in the wash the stains remain, faintly, as a reminder of a meal that started long ago and, in a way, is never finished. Perhaps you have some laundry tricks that I don’t have? Or you use paper tablecloths and napkins? Never mind. You get my point. 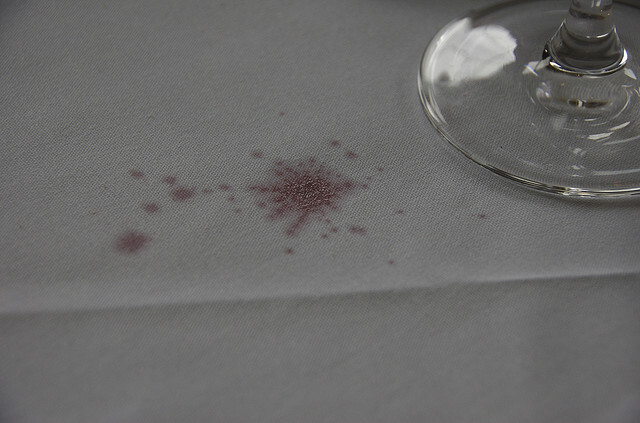 When you infuse something as strong as red wine into an absorbent piece of cloth, a faint awareness of that wine lingers. Future meals are infused with and informed by the memory of that small holiday disaster. Your novel is like that. It’s the dining room, a place where many meals are eaten and finally add up to a life. Every one of those meals, though, involves that tablecloth and napkin which are imprinted with something which I would call your protagonist’s greatest need. That need is always present even if you cover up that stain with a table runner and cleverly fold the napkin. You know it’s there. You are always aware of it. Have you come across scenes in excellent novels which seem to have no plot purpose but which work anyway? Have you ever felt the undertow of a character’s yearning in commonplace action, tugging your awareness down below the surface of an everyday situation? Such scenes are infused with the point of view character’s fundamental, underlying and (as yet) unmet need. Identify your protagonist’s greatest inner need, the one that would preoccupy your protagonist even if your novel’s plot were never to come about. Craft a sentence or short paragraph that succinctly expresses that need. Pick out a scene from the middle of your WIP. Try to make this a minimally dramatic scene. Turn to a fresh sheet of paper or open a new document. Paste in the sentence or paragraph you created. This is the opening of a new version of the scene you’ve selected. With the underlying need just below the surface of your protagonist’s awareness, rewrite the scene. Do not look back at the version in your WIP! The purpose of this rewrite of the scene is to get me, your reader, to feel the underlying need that you’ve identified in your protagonist. Work until you’re sure I will sense it even though you don’t mention it or make it plain. Finally, go back and delete the paragraph you pasted in at the scene’s start. Done. What you should have in a new version of this middle scene that is infused with the tension that comes from your protagonist’s greatest underlying need, yearning, dream or hope. The tension will be below the surface but nevertheless felt by your readers, or should be. A fundamental, unspoken need is the undertow that pulls your protagonist—and your readers—toward somewhere nameless yet urgently important. When that infused tension is present it makes humdrum scenes magnetic and story detours a wholly necessary part of the journey. What’s your protagonist’s underlying inner need? How is it infused in the scene you’re working on right now? Great advice and very timely, Donald. I am struggling with this very issue in my WIP. I have a strong sense of my protagonist’s inner needs and struggles, but I am having trouble getting it on the page in a way that connects with the reader. I am going to try your exercise. A writer must keep in the forefront of his mind the character’s internal goals and needs, which is not always easy to do when the writer is caught up in writing scenes. Be sure not to simply revise the original scene, re-envision it. Get at it from a whole new angle. That will produce the best results. Robert Olen Butler once said that, as a teacher in the PhD program at Florida State, he gets the finest writing students he could ask for. They all arrive knowing nine out of the ten things they need to know to be great writers. The thing they never seem to understand is yearning. John Truby says it’s important to first understand the weakness/need of your protagonist, well before you understand the desire/goal (the outer objective in the story). Too many novels founder because the characters scramble on the level of surface want instead of the deeper, more meaningful level of yearning/need. But it’s also true that many if not all great characters are unclear or in denial of their yearning when the story opens. The conflict the character faces in pursuing the outer objective peels away that lack of clarity or denial. The character has to ask: Is this struggle really worth it? Why am I doing this? Why not just pack up and go home? The answer is the yearning. And yeah, it’s there like an obbligato throughout the story, or the text devolves into chatter. Great exercise, Donald. I fully intend to steal it — which is the best compliment I could possibly provide. With you on the yearning, David. It gives a drive to the character before the story opens. So many times a new writer begins at “square one” on page one, when there should be a square occupying or–better–obsessing the character before the start. Bob Butler is great on this topic. One could look hard and not find better illustrations of the principle at work than in his own writing. Bob has his own method for getting there, which is simple. He is a disciplined writer (writes every day) and in each writing session has one goal: Go (as writer) to the most dangerous place he can find. True. Yet while a character may not know their own yearning you, the author, do. Or you will discover it in the process. Or you will simply sense it in the darkness, or light, in which you immerse yourself. Great post, Donald. And so timely for me. I’m in the middle of the “final edit” of my book. Am going to try out the exercise for a couple of scenes in my book that I was going to kill. (based on the results, one of them would stay and the other would have to go). Thank you. I will most certainly post an update once I write the two scenes. Have to answer that question before I work on the scenes. Thinking, writing and seeing where this goes. I have that one taped onto my computer. Now there will be a wine stain next to it. I spent a lot of hours pondering my protag’s deepest yearning. Months, actually, because its like peeling an enormous onion. What you describe here always felt like magic to me, a ‘secret’ power that writers were born with! That it can be learned and practiced and crafted takes away none of the magic now. Thanks for your post. Yes, same thing. Now, don’t go actually touching the third rail in the NYC subway system. Not a good idea. But the electric current buzzing and zapping all the time, the force hurtling the train down the tracks in a story, is the protagonist’s urgent, unstoppable need. I was looking at the protagonist for the story I’ve been working on, which precedes my trilogy manuscripts, and I noticed something interesting. His longing has much to do with his father, as does the longing of my protag for the trilogy. The funny part is that the longings seem to be inverse to each other. The sire longs for approval, to be worthy of his clan’s glorious legacy, but the barrier he feels he must overcome is the restoration of his father’s tainted honor (dad was an outcast, accused of murder). The progeny’s longing is also ultimately for approval and worthiness, but he (perhaps wrongfully) considers his father’s taint (also considered a killer, but an unstable one, to boot) to be a barrier. Huh. You’d think I have daddy issues. Oddly, I always considered my dad to be an exemplary role model. We were close until his death, twenty-five years ago. Thanks for the great exercises, Don. Off to infuse! Yes, that sounds right. However, as you discuss it the breach between them is based on plot circumstances rather than heart needs. Try getting down to the simple human things that your protagonist wants from the father he will never meet: a hand on his head, a warm loving look in his father’s eyes. Think heart yearning. Great! Timely, as I’m about to launch into my first revision. This totally makes sense to me. And honestly, people do this in real life all the time. When people have a longing, yearning, or need, it doesn’t just go away. It lurks there beneath your surface activities, patiently insistent. We can distract ourselves from it, but what doesn’t change is that its always there affecting what you do and say. Of course, novels need to be more distilled than real life, but this is a great reminder!! This is awesome advice! I have compared writing to many of things but not this. This is great! i am definitely sharing this post. I love how you talked about the protagonist a lot. Many writers who write a novel do not know what a protagonist is. And many experienced writers, while they may know what a protagonists is, they do not know their protagonists’ true hearts and the longing that drives them onward. But the protag’s needs and wants are often two different things. For example, in my current wip, my young protag wants to win a track scholarship. He’s focused on that goal. What he needs is to notice the suffering of those nearest to him. As Mr. Bell suggests, he crosses from his want to his need at the midpoint, though he doesn’t fully accept the need for some time. So in your example above, do I use the want of gaining a scholarship and success? Or do I hint at the need of compassion and understanding? Your question makes me think of our six-year-old son. We point out to him all the time the difference between a “need” and a “want”. Ice cream is a want. Vegetables are a need. I’m not sure that metaphor carries over, exactly, but in your case I’d say that gaining a scholarship and success are surface wants; a deeper and truer need is to connect. I’m with Susan in admiring your wine-stain metaphor for infusion. Through it, I know exactly what you mean: a ghostly presence that grows clear or faint, but is never wholly absent. My central POV character’s inner need is made clear to the reader from the beginning. And that need–for meaningful love and connection–is manifested in her behavior towards others. To get fancy about it, she more or less sublimates her inner need by helping others, by being a friend. But I don’t want to “infuse” every scene with Brenda Contay’s deep need for a meaningful love relationship. The reason is that my story is a suspense novel. In suspense, the reader is on tenterhooks (or should be), anticipating the big, bad thing that’s been getting ready to happen throughout the narrative. When it comes, I want the reader to first be shocked by how Brenda reacts, but then see how that reaction makes perfect sense in terms of her inner need. If up to that point I’ve given too much emphasis to her need, I think I risk losing the second half of my one-two punch. Hmm. Thrillers are an interesting case in point. Virtually all thriller manuscripts motivate characters–cause them to act–because of external plot circumstances. That’s okay, as far as it goes, but it’s one of the reasons that thriller characters often feel shallow and cardboard, puppets running at high speed. Those protagonists grip our hearts, rather than just cause us to keep turning pages. Just sayin’. Thank you. It would seem that you don’t make a distinction between suspense and thriller novels. My understanding (highly simplified) is that in thrillers, the protagonist is throughout struggling to prevent a disaster. In suspense, the action builds toward a disaster, but the protagonist is often not aware of what’s coming. In other words, suspense has more access in its toolbox to dramatic irony. I’m a great fan of this. I like it as a reader, and as a writer, the reader placed in a position of superior knowledge, watching the disaster build, all the while watching the protagonist acting in ignorance of what’s coming. Don, I often think I know what that yearning or need is for my characters before I write, and while executing the early chapters, but usually it becomes far more clear to me nearer the halfway point through a manuscript. I’m 2/3 through my WIP, which has six POV characters, and this is the very thing I’ll be focusing on for each of them when I go back in for a revision later this year. Thank you! I need to be reminded of these things over and over again. Congratulations on your Christie Award for Burning Sky! Beautiful analogy, Donald (I love red wine). What we yearn for, as writers and for our characters, is everything. Thanks so much for the reminder to crank up the tension on every page of our novel. I love red wine too. My abiding passion for the cabernets for the Alexander Valley has given way to an extended flirtation–maybe affair?–with the tempranillo’s of Spain. Ah, those foreigners! So seductive. Don this is really great, especially in a novel where a protagonist’s story is progressing through a tight time arc, even as a big, scene-stealing disaster unfolds. Back to WIP—on deadline—but wanted to say: READ and USING! Thanks for yet another enticing post. You echo the advice I’ve internalized after my last round of query workshops: “What is your protagonist’s main goal? What obstacles are in his/her way? What does he/she do to overcome them?” Every day when I sit down to write, I ask myself these questions, along with, “how can I make this stand out even more?” (Often the answer is to raise the stakes; “what does he have to lose? How can things get worse for him? How can this pay off?”). Putting your message together with Lisa Cron’s, I think there is a useful lesson for all of us: Conflict drives story. It is the railway that carries us from beginning to end. Plot is the tracks that direct your characters across the landscape of your narrative, but a train goes nowhere without an electric surge – a character’s core desire, be it conscious or subconscious. Plot away all your like, but if you lack this in any part of your story, then the train grinds to a halt (that’s as jarring a sound as silent readers). Conversely, even when the tracks might be ordinary, if they are charged with current your reader zooms ahead, eager for a window seat beside the character they’ve bonded with. Immediately, Song of Ice and Fire comes to mind. I remember reading the books, and when I read book four, the one many readers complain has no plot, I felt compelled to read as much as in any other. Why? I think it is because Mr. Martin connects so well to his characters’ core desires, so the side-by-side journey compelled me to read; from this author I learned that a story can be exciting even without an exciting play-by-play. We can extend this further to our own writing. If we’re relying on plot to keep a story moving, let’s try again. What about character? What about connecting to that character’s deep yearnings? Think logo design. Excellent logos have unity and strength, but are simple. They speak their message strong and clear. Complicated logos get overlooked if they bury the message. So we, as writers, must remember to connect to our characters, always, on every page, even if it means rewriting whole scenes with radical new (and simpler) approaches to get to what matter most. Ah! You’ve got it exactly. George Martin’s novels are an excellent illustration too. No plot? Maybe not, but there’s plenty of the true story and that’s what pulls us along. Now I must go design my own logo. Now there’s a challenge. Good luck on the logo! I’ve heard that, for best results, you’re best making plenty of sketches (20+) before you settle on one design. Hmm…I bet that idea carries over into writing. This was a fantastic post along with all the helpful comments and examples. I am starting a revision of a book that’s a wooden as it gets because I’m still writing it on a surface level … the reader cannot feel my heart. Your exercise makes it less torturous to expose it. Thank you. Yearning. Yes. It drives us all, in ways we can see and ways we can’t. I write series fiction — cozy mystery, another subgenre where, like thrillers, the external plot sometimes gets the bulk of the writer’s attention, but delving into the characters’ longings will give the readers a deeper experience. In fact, I think exploring that yearning and its many layers is crucial to making series fiction work. Thanks for another good lesson! I think this is a brilliant way to really get to the core of the protagonist! I am now realizing that one of the reasons I get so frustrated when I am working on a short story or novel, is the lack of depth some of my characters seem to have. I want my readers to know who the character is; not just read who the character is. This method is going to help me out tremendously! Great post! Perfect post for me right now as well, Donald, thank you! Just picked up my marked up copy of the FIRE IN FICTION again yesterday, because I felt I needed a boost. Then today, I see this post! Are you connected to my writing vibes?! I have a white rug with the remnant of a red wine stain from my wonderful, but highly rigid and clumsy father-in-law, who passed away just a couple of years ago. I look at that stain and I am reminded of the deep nature of the man that that stain represents to me now. I’ll never get rid of that rug! Red wine…seeping, characters actualized through their deep longings. That is exactly what is missing in those sagging middle chapters of mine. It’s not enough to string the events, the depth of each one is really what I, as a reader, want! You’re the best, thank you for this great gift today! Wonderful post, thank you so much Don! That heart yearning is so much what I need to focus on in my story. I’m struggling with the word count constraints of a novella, and it’s easy to let plot run the show and end up with a story that feels shallow and contrived. Focusing on infusing that core need into every scene, even if the character isn’t consciously aware of it yet, is precisely what will add the emotional depth I don’t want to lose. I love this post, Don, and the comments were an added bonus. I’ve always described that stain as “psychological weather” or a “psychic stain”, oddly enough.